Nampa is located in the southwest corner of Idaho. Surrounded on three sides by mountains, it is literally in the heart of an area called “Treasure Valley.” The city of Nampa is primarily an agricultural community. However, its convenient proximity to the state’s capital, Boise, a scenic 10- to 20-minute drive away, allows Nampa Idaho all the benefits of being a much larger city. Homes for sale in Nampa are very affordable and offer homes for young couples, retired and everywhere in between. Nampa, ID has a Mayorial/Council form of government. The four member city council members serve staggered four-year terms. The city has no city sales tax or inventory tax and the rate of tax on property is .0087 percent of cash value which makes it the lowest among other major cities in Idaho. Nampa has a lot going for it besides a rich history; it has a growing business community, heath care facilities, great schools providing education from preschool to advanced degrees (NNU,Boise State), plenty of arts and entertainment, as well as fantastic recreation. 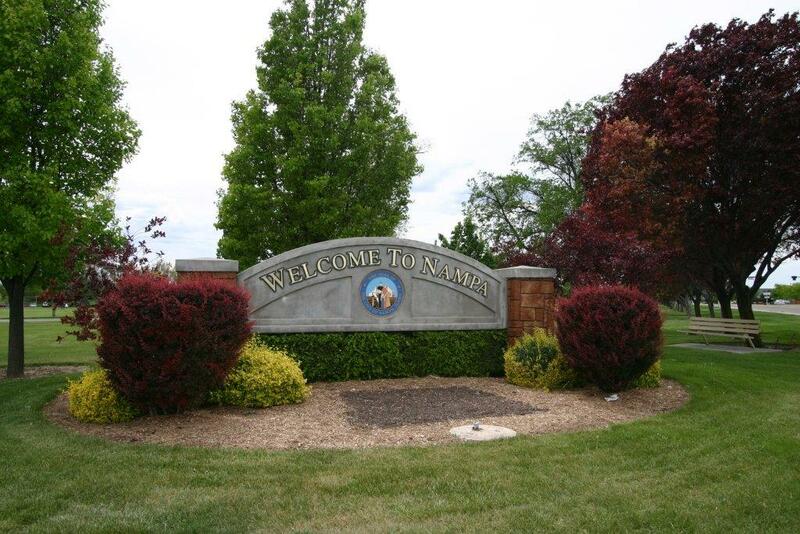 Nampa is a wonderful place to live, work or play. The key to its appeal may be found in its thriving economy or its laid-back, old fashioned way of life. Whatever the magic ingredients, locals feel Nampa has the perfect combination necessary for a comfortable lifestyle that is affordable for people in all walks of life. Nampa’s climate is moderate year-round, and its position in Idaho’s high desert region offers breathtaking landscapes which can be enjoyed from many of the city’s neighborhoods. The city enjoys a low crime rate, and the area homes offer a quiet escape from the hustle and bustle that comes with living in a big city. The relaxed atmosphere of Nampa draws people to the area and makes them want to stay. As good stewards of the generous assets of this region, Nampa is planning carefully for future growth well into the next century, making every effort to ensure that the growth does not compromise the characteristics and values which have made Nampa the desirable place to live, work and play that it has become. 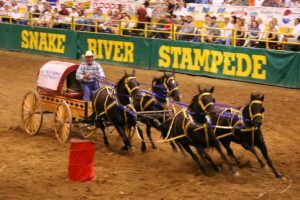 Nampa Idaho is home to the famous Snake River Stampede which is held at the Idaho Center located just east of Nampa. Professional PRCA Cowboys make the stampede an annual stop on the pro curcuit. The rodeo is held each year July 15-19th. It is loads of fun for grownups and children and an event you don’t want to miss. The Ford Center is a venue that includes a 10,500 seat amphitheater which features a 40 by 60 foot stage plus a 12,279 seat indoor structure featuring 31,200 square feet of arena floor space. The Idaho Horse Park is used for horse shows and the Sports Center is used for track and field events. Performers like Jack Johnson have performed at the amphitheater and performers like Cher, Aerosmith and Eric Clapton have performed in the indoor structure. Basketball, monster truck events, circus and many more events take place in the indoor structure. President Bush spoke at the Idaho Center when he visited Idaho in 1005. Nampa offers many indoor and outdoor recreational opportunities. The nearby Snake River which is located about 15 minutes south of Nampa sight seeing, fishing and Jet Boating. Lake Lowell located just minutes west of Nampa offers water skiing, fishing for crappie and bass. Family pinic areas surround the lake in the area known as the Deerflat Wildlife Refuge The refuge is a haven for hundreds of wildlife species inluding whitetail deer and birds. The area also offers golfing, biking, hiking and many other outdoor activities. The Nampa Civic Center is a 42,500 square foot facility that is home to over 750 annual events including company banquets, home shows, performing acts, award banquets and much, much more. It is a state of the art facility located near the city hall of Nampa. Nampa ID Real estate options consist of residential, commercial, resort and investment properties and Homes for sale in Nampa offer an array of options for home buyers. The clean, tree-lined streets in residential neighborhoods include single-family homes, ranging in price from well under $100,000 to more majestic estate homes in the $1 million or more. There is also a small selection of condominiums and townhouses available. Whatever your preference, there are several selections from which to choose!